Clitheroe manager Lee Ashforth lamented the club’s extensive list of casualties after taking a backwards step in defeat to Market Drayton Town. The Blues had dug themselves out of a hole when taking four points from games against Glossop North End and Trafford but a trip to the Greenfields Sports Ground, without key personnel, proved one step to far. Ashforth was without influential midfielder Jay Jeffries for the trip to Shropshire as well as centre half Alex Low while leading scorer Max Hazeldine was carrying a knock. Jeffries travelled with the squad at the weekend only to fail a late fitness test and it was Hyuga Tanner who deputised in the middle of the park. “Alex Low and Jay Jeffries were out of the team, Max Hazeldine played the first half but was carrying a hip injury from the other night, so taking those three out of the team made us look very disjointed,” said Ashforth. “We just didn’t turn up, we were really flat, we just struggled to get ourselves going from the first minute. “Because we were so far away JJ wanted to come down with us and have a fitness test before the game. “His ankle has blown up like a balloon but he’s the type of lad that will still play even if he’s carrying an injury. “We brought him down but we knew we had Hyuga anyway who has played really well over the past two months. We put him in today, I don’t think he was great by any stretch, but there were others as well. “With someone as influential as JJ we’ve got to give them every opportunity to be right for the game. “He wasn’t so we put him on the bench but we weren’t going to put him on unless we really had to. Once they got the goal early in the second half there was no point in using him. Hazeldine struggled to impact in an opening 45 minutes which saw the home side take the lead with the last kick of the half. The Blues’ leading scorer didn’t return for the second half, with a hip injury proving too debilitating, and he was replaced by Harry Blackburn. “We asked him at half-time if he could give us a bit more but he said that he was struggling to run,” Ashforth said. Phil Marsh had fired just over the crossbar early on after taking Bevan Burey’s cross down on his chest while Antoine Recizak’s attempt five minutes later was just as close after twisting and turning on the edge of the box from Ben Purdham’s clearance. At the other end, from a percentage punt forward, James Jennings had a great opportunity to break the deadlock when taking the ball around Purdham, but the striker failed to keep the ball in play. Jennings did get on the scoresheet before the break but it was a moment of contention that had Ashforth and his team up in arms on the sidelines. Burey was clearly upended on the edge of the penalty area but, with the infringement ignored, Town turned defence in to attack and scored. 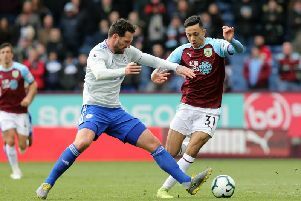 “It’s obvious to everybody, I spoke to their lad when he was coming off the pitch at half-time, just after I’d spoken to the referee, and he said it was a clear foul,” said Ashforth. “It’s unbelievable how he hasn’t given it. We were in an attacking position then but we go 1-0 down. The referee is doing a job, he’s obviously more well-known to them than he was to us, and I felt like he gave them decisions all day long. “But we’ve been beaten 3-0 and we can’t blame the referee for that. The first goal shouldn’t have stood, it should have been our free kick, but we’ve been beaten comfortably. Clitheroe continued to slip back in to their old ways in the second half, they were a shadow of their former selves. Jennings expertly steered a cross home for his second of the afternoon in the 52nd minute while Charles Knowles completed the scoring deep in to stoppage time when swinging his boot at a speculative left wing cross.